I have plenty of recipes for chocolate brownie cookies, but considering the source, I couldn’t resist trying this one. It’s from one of my most-loved, most-used cookbooks, The Modern Kosher Kitchen: More than 125 Inspired Recipes for a New Generation of Kosher Cooks by Ronnie Fein. I won’t say too much about how great this book is since it’s the brownie cookies you’re here for, but if you need simple but innovative dinner recipes, check out the Amazon reviews. Thus far I’ve mainly used the book for savory dishes, but based on these cookies I’ll be paying more attention to the dessert section. Okay, so moving on to the recipe! Ronnie Fein got this recipe from Jami Curl who owns and runs two bakeries in Portland — Saint Cupcake and Quin. Jami’s talents will become apparent when you try these cookies. They’re simple and balanced in flavor and texture, yet rich without being too sweet or fatty tasting. As far as chocolate brownie cookies go, this one gets an A+. 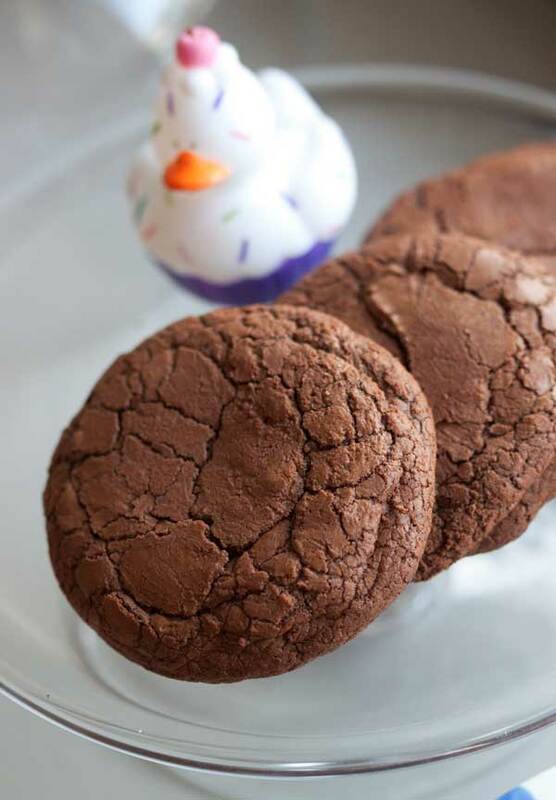 Chocolate Brownie Cookies adapted from Modern Kosher Cooking by Ronnie Fein. These are perfectly balanced and dense, fudgy and soft. They don't need any added chips or chunks. Do not preheat the oven yet. Combine the butter and chocolate in a microwave-safe bowl and melt at 50% power, stirring ever 30 seconds or so. Alternatively, you may do this in the top of a double boiler. Set chocolate aside to cool. While chocolate cools, sift together the flour, salt and baking powder and set aside. In a large mixing bowl, using an electric mixer, beat the eggs, yolk, both sugars and vanilla on medium speed for about 3 minutes. Add the flour mixture and stir until blended. Let the batter sit for 20 minutes to thicken. You should not need to refrigerate it, just let it stand. Preheat oven to 350 degrees F. and line two baking sheet with parchment paper. Use a 2 ounce scoop or measuring cup to form 12 large mounds. I rolled mine into balls. Arrange 6 mounds (or balls, in this case) on the baking sheet and bake one sheet at a time for 15 to 17 minutes (check at 13). The cookies should crack and appear moist on the inside. Your recent post about Buckeye Cookies made me think about these and that I hadn’t made them yet. They are very good! I’m so glad I finally tried them. Judy, I think it would work, but the cookies might lose their glossiness. Not that these were extremely glossy/shiny to begin with, but I’ve noticed that when I chill double chocolate cookie dough the cookies have a duller finish. They are usually puffier, though, so that’s a good thing. It’s definitely worth a shot. Or you could just bake the cookies, wrap them tightly and freeze. Anna, do you think I could form these cookies on a silpat, freeze them and then bake them from the frozen state when I want to serve them? Hi! This cookie recipe looks incredible! I have never heard of chocolate brownie cookies, but now they are on my radar for recipes that I will try. I have a food blog, myself, and I have focused more on desserts solely for the reason that I love sweets.I will most definitely try this at some point in the near future. Exceptional work! Sue, I hope you like them! Thanks for mentioning the Brown Sugar Snickerdoodles. I’m making a list of all the best recipes here (another one) and need to make sure that recipe is on it. I’m trying out a new cupcake recipe today. This sounds like a great recipe! I can’t wait to make these. I love that they get an A+ without add ins. On a side note I’m in the midst of making your brown sugar snickerdoodle cookies to send along with my husband. My father in law loves those cookies as does everyone else I’ve ever made them for. Funny that I came to your site right after looking up weight watchers’ new plan. Yikes! I have been meaning to try a brownie cookie for ages. This looks like a good start. Yum! I’ve never heard of chocolate brownie cookies and they look and sound delicious!! !